Chinese cannery workers labor inside a cannery in Astoria. This exceptional image shows much of the salmon canning process. From butchering fish with a gang knife, to filling and weighing cans, to soldering filled cans and venting them before sealing them again, until the cans are placed in retorts and finally submerged in water to test for any bubbles. West Shore, June 1887. The first Asian American cannery workers entered the salmon industry in 1870 at George Hume’s cannery on the Washington side of the Columbia River. This was just six years after the Hume family founded the canned salmon industry. That year, Hume hired fifteen Chinese men to work in his cannery. By 1874, only one of the thirteen canneries along the Columbia River had anything but an entirely Chinese crew. Chinese cannery workers travelled to Alaska in 1878 to help establish the first canneries at Klawock and Sitka. As early as 1875 canners came to rely on Chinese labor contractors to provide nearly all the “inside” labor for the processing operation. Contractors were responsible for all aspects of managing the cannery crew, from recruiting, to overseeing work and production in the fish house, to feeding the employees and paying them at the end of the season. Labor contracting provided a means for Asian immigrants to get work. For the contractors, it was a way to become wealthy. For example, when labor contractor Goon Dip died in 1933, he was president or on the board of directors of four different businesses, owned shares in mines, and was the Chinese consul in Seattle. Goon Dip Mountain and Goon Dip River on the west coast of Chichagof Island in Southeast Alaska are both named for this high profile Chinese labor contractor. Early on, cannery work wasn’t necessarily low-skilled, since it required finesse and practice to efficiently butcher fish, make cans by hand, and test cans to ensure they were properly sealed. 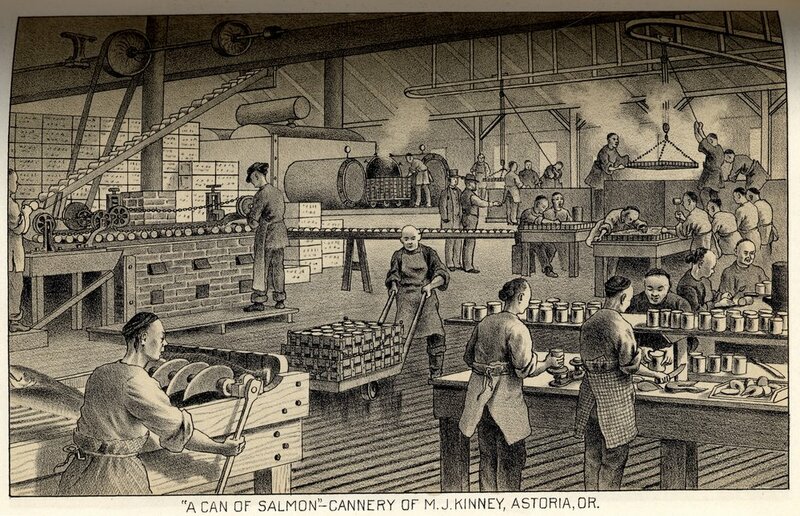 There wasn’t much incentive for canners to invest in new machines or dedicate resources to inventing labor-saving technologies when the canneries only produced canned salmon for a short portion of the year. Much-touted innovations in the canning industry, like Edmund Smith’s “iron chink,” were not invented until decades after the establishment of the canned salmon industry. This can partially be attributed to the fact that canners had little incentive to mechanize since Chinese labor contractors provided an inexpensive, steady, and flexible migrant labor force. As canners adopted new technologies, Chinese cannery hands weren’t eager to abandon their skilled positions for what had become factory work. Chinese labor contractors sent inexperienced hands, often newer immigrants from Japan or the Philippines, to canneries that used new technologies so that the Chinese could cling to positions that were treated more as trades. This dictated the ethnic composition of canneries and the communities nearby. But as mechanization increased, Asian American workers were stuck in the same places within the cannery as the Chinese tinsmiths who had come before, even as the work had become increasingly lower-skilled. Machines changed, but the purview of the labor contractors and their employees within the cannery did not. Labor contracting impacted the invention and adoption of new technologies and what ethnic groups worked at which canneries. The very landscape of the cannery was also shaped to accommodate the segregated work force. This was especially true in Alaska, where canneries had to provide bunkhouses and messing quarters for workers, since the plants were rarely established within or near an established settlement. The architecture of segregation was evident in salmon canneries across Alaska. Ethnicities were segregated into different bunkhouses, mess halls, and bath houses, in addition to the segregated work assignments that developed, partially due to the labor recruiting channels adopted by the industry. There were nefarious aspects of labor contracting. Some workers were never paid at the end of the season. Others left Alaska in debt to the contractor due to losing their earnings in contractor-run gambling rackets. Cannery workers were forced to purchase unnecessary goods, like fine suits at elevated prices from the contractors. Moreover, the only work that was made available for the Asian American cannery hands was in the fish house. Fishing jobs, mechanic work, and beach gang employment was reserved for whites, and to a lesser extent, Alaska Natives. Journalists in the 1920s drew attention to the cramped and filthy quarters provided to the minority crews on the ships that carried the workers to and from Alaska each year and other shadows inherent within the contracting system. Cannery workers and others filed a lawsuit against a San Francisco labor contractor, Mayer and Young, during which the workers’ attorney asserted that the contractors were responsible for “the worst case of slavery since the Civil War.” The tarnished public image of labor contracting, paired with the Great Depression and the ascent of cannery unions, spelled the end to labor contracting within the salmon canning industry.